Bottom Line: a neat and novel design that’s really optimized for outward surround sound or even reproduction throughout a room. Otherwise doesn’t make much sense for centralized near/mid-field listening and money would be better spent in other places – see the end for alternative recommendations. The SR9040 and 9080 are Definitive Technology’s newer so called “bipolar” bookshelf speakers, meaning they fire in multiple directions – from the picture above you can see the dual sets of tweeters and woofers positioned roughly perpendicular to each other, resulting in a neat looking almost cylindrical shaped speaker. The drivers are inverted on one side interestingly, the tweeter on the bottom and woofer on top, but we don’t see how that would have any significant effect on the sound, and you wouldn’t be able to tell with the covers on anyhow. Definitive Technology has been pushing the bipolar concept since the early 90s, and the rough idea behind it is that it brings particularly immersive sound throughout the room, not just in a central location. The appeal of this mixed – while some might like the idea of speakers sounding consistent throughout a room, others might prefer them to be really optimized towards a central listening location. The power specs are pretty decent but not exorbinate (unlike their bipolar towers which have massive power specs, check out our review of one here). It’s safe to assume that the towers are intended to be the main satellite speakers in a system while these bipolar bookshelfs are designed as surround/ancillary speakers. They could certainly suffice though as a standalone pair, and might actually do a particularly great job of evenly filling a room at a distance. The design choices would corroborate this: While most companies opt for a vented design with a port, Definitive Technology is one of the few companies that makes a lot of sealed speakers. In conjunction with their smaller aluminum drivers, this kind of design allows for a lighter and more compact speaker to really fire outward at a decent volume. The response floor of these speakers is decent, but a 2-way bookshelf speaker with smaller woofers is generally going to lack bass – it’s just not designed for that, and if they’re going to be used as main satellites they’d definitely benefit from an added subwoofer. The company doesn’t specify a standard 3 dB differential in their reported response range, so we’d wager there would be a drop off even above ~50 Hz. Aesthetically the speakers look quite neat, definitely a distinct upgrade from your normal front foam covered rectangle. Definitive Technology is definitely one of those companies that focuses on making cool modern looking gear. 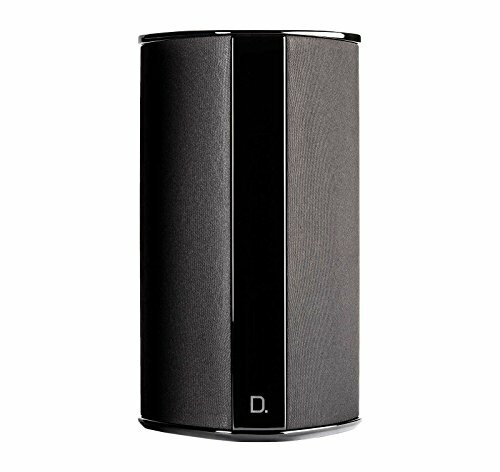 All their passive speakers have a 5 year warranty which is pretty top of the line coverage. We always like unique product designs to, if anything, at least give consumers an additional kind of option. 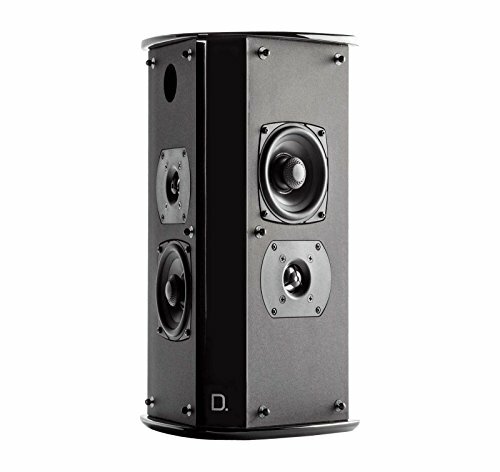 Definitive Technology is certainly one of those companies that does that, and we haven’t seen any other budget-tier multi-directional speakers quite like these. They do have a clearly intended purpose though: to augment surround sound, or to give even reproduction of ambient style music throughout a room at a distance. They’re a bit expensive, but we generally endorse DT speakers and, given that they’re sort of a one of a kind product (for now at least), we’d say go ahead and get them if they appeal to you. We have seen them start to get discounted recently so a good deal may be had now. If you’re looking for mid/near-field speakers we definitely wouldn’t recommend these – the build and design just doesn’t really make sense for that. Instead we’d say get a pair of cheaper conventional bookshelf speakers with comparable specs and take the money saved and spend it on a nice subwoofer. Check out the links below for some such alternative recommendations.